Well, it was a few years ago, Google introduced their stunning operating system into the smartphone market. After that, we saw the growth of the tech giant Samsung by launching a series of smartphones that sporting this innovative OS. The cost of those phones was too high compared to the present case. At present, low to middle class people can buy and use Android phones as they are too cheap in the markets. Micromax, the popular Indian brand has released Micromax Smarty A25 which is labeled as the cheapest Android phone released until now in India. The launching of this phone indicates that the cost of Android will become even lower in the upcoming year 2013. Because this phone costs just Rs 3,249 in India! But Micromax also missed some needed features such as 3G, proximity sensor and ambient light sensor to make it more cheap. In fact, it is the first Android phone without 3G support. See the detailed features below. First of all, let me tell you the features the Micromax A25 equips with. 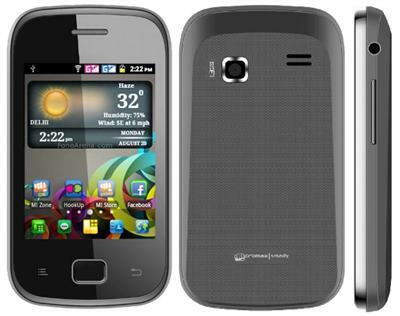 It is dual SIM and is equipped with Android 2.3.6 Gingerbread operating system along with 1Ghz processor and 256MB RAM. Therefore you need not to worry about the speed of the device as it is guaranteed with these components. You can play Ninjump and the Angry Tarzan games without any lagging or any other troubles. The display of the phone features 2.8 inch TFT Capacitive Touchscreen with a resolution of 240 x 320 pixels. Even though it lacks other important sensors like proximity sensor and the ambient light sensor, it is packed with the G-sensor that lets you change the SIM by rotating the phone into 360 degrees. It has a 1.3 mega pixel camera with 4x digital zooming, Multi Shot and Night Vision features. About the storage capacity, it comes with 120MB internal memory and up to 32GB external memory support. Supported formats are MP3, WAV, MID, 3GPP, MP4 for music and MP4, 3GP for videos. In the absence of 3G, you can connect using Wi-Fi (802.11 b/g/n), USB, EDGE, Bluetooth and GPRS options. The power comes from a Li-ion 1280 mAH standard battery that offers a back up of 4 hours for talk time and up to 180 hours for standby. Along with these features, the Micromax Smarty A25 is pre-loaded with several apps such as Hookup Service, YouTube, Facebook, NQ Mobile etc. and Micromax' own Mi Store and Mi Zone apps. At Flipkart online shopping store, this phone has got an average rating of 4.6/5 based on a total of 69 ratings, given by the buyers. Now look at the user reviews of Micromax Smarty A25 below. 1. Absence of 3G is the biggest problem. 2. 1 GHz processor is a good plus. 4. Battery back up is good, up to 1 day. 6. It is capable of playing HD 720p videos using MX Player. Do you wish to know where to buy Micromax A116 Canvas HD online at cheapest price? Customers in India can buy Micromax A116 Canvas HD from Kaunsa.com or pre order it now at Chipkart.com paying just Rs 550. With Rs 13,900 as full price, the device would be delivered within 15 days. Set for sale on 14th February, 9000 units were booked in less than 24 hours.